Energy can most simply be described as the ability to do work. Most of the patients I see report insufficient energy to complete their daily tasks. When presented with this case, one of the approaches I take, regardless of etiology, is to think about basic biochemistry. How might the most fundamental processes of cellular function influence the subjective complaint of low energy? We'll address the role of cardiolipin in supporting energy in this post. Mitochondria, through the process of oxidative phosphorylation, provide the energy for our cells to do work. Oxidative stress is part of the unavoidable by-product of extracting energy from chemical bonds, for which CoQ10, superoxide dismutase, glutathione, among other detoxification and processes mitigate the collateral damage and help mitochondria continue to do its work. One particular component of the mitochondria that may be especially sensitive to oxidative damage is cardiolipin, a phospholipid located in the inner mitochondrial membrane that appears to stabilize respiratory chain complexes and increase the efficiency of oxidative phosphorylation, among other essential functions.1 Cardiolipin is often considered the signature phospholipid of the mitochondria as it is exclusive to this organelle's membrane. 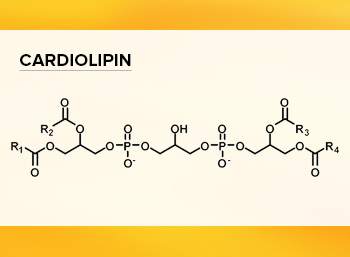 Cardiolipin is structurally different than other membrane phospholipids as it contains three glycerol backbones and four fatty acyl chains. This composition makes it highly specialized in maintaining membrane potential and architecture, but is also why it is especially vulnerable to oxidation by free radicals.2 From a microscopic perspective, mitochondria, and specifically cardiolipin, are important for our cells to be able to produce the energy we need to function. If mitochondria and cardiolipin are the foundation for providing ourselves with adequate energy, can we support their function? 1. Paradies G, Paradies V, Benedictis VD, Ruggiero FM, Petrosillo G. Functional role of cardiolipin in mitochondrial bioenergetics. Biochimica et Biophysica Acta (BBA) - Bioenergetics 2014;1837(4):408–417. doi:10.1016/j.bbabio.2013.10.006. 2. Schenkel LC, Bakovic M. Formation and Regulation of Mitochondrial Membranes. International Journal of Cell Biology 2014;2014:1–13. doi:10.1155/2014/709828. 3. Menshikova EV, Ritov VB, Fairfull L, Ferrell RE, Kelley DE, Goodpaster BH. Effects of Exercise on Mitochondrial Content and Function in Aging Human Skeletal Muscle. The Journals of Gerontology Series A: Biological Sciences and Medical Sciences 2006;61(6):534–540. doi:10.1093/gerona/61.6.534. 4. Si H, Liu D. Dietary antiaging phytochemicals and mechanisms associated with prolonged survival. The Journal of nutritional biochemistry. 2014;25(6):581-591. doi:10.1016/j.jnutbio.2014.02.001. 5. Bhasin MK, Dusek JA, Chang B-H, et al. Relaxation Response Induces Temporal Transcriptome Changes in Energy Metabolism, Insulin Secretion and Inflammatory Pathways. PLoS ONE 2013;8(5). doi:10.1371/journal.pone.0062817.